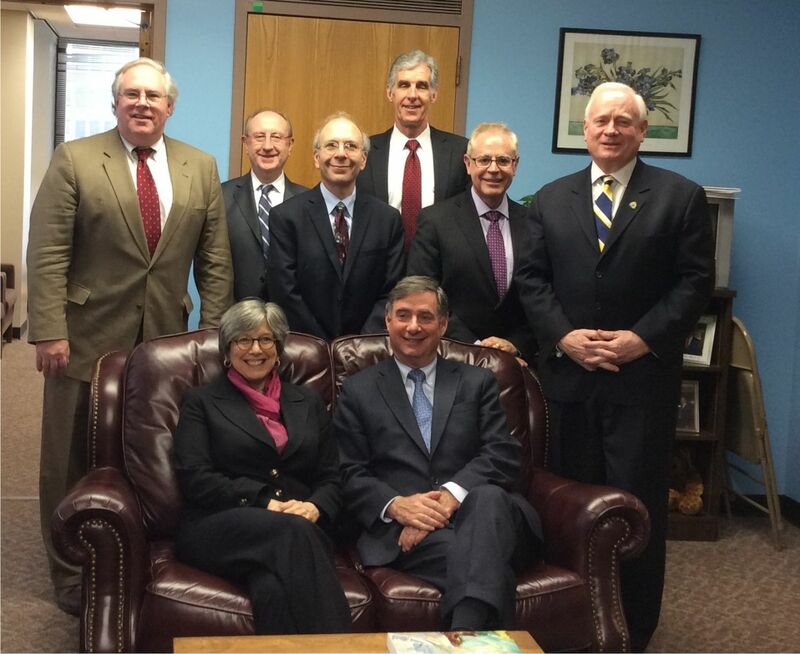 Led by four medical school deans and three star research scientists, the Associated Medical Schools of New York descended on Albany on March 12 for its annual advocacy day. AMSNY met with distinguished legislators and policymakers, including Assembly Speaker Sheldon Silver, Senate Majority Leader Dean Skelos, Assembly Majority Leader Joseph Morelle, Senate Health Committee Chair Kemp Hannon, Health Commissioner Dr. Nirav Shah, as well as the Governor’s Deputy Secretaries for Education and Economic Development. Biomedical research – particularly support for the intellectual capital that drives the discovery of new diagnostic technologies and treatments – was the focus of the day. New York State is the third-largest recipient of National Institutes of Health funding for research, drawing $2 billion annually. But as NIH funds decline across the country, states like California, Massachusetts are making their own billion-dollar investments in research and attempting to recruit New York’s world-class scientists. AMSNY urged legislators to support a bill (Senate 6500 and Assembly 9000) that, when enacted, will provide funds for medical schools to compete for top scientific talent. New York State has several existing programs aimed at specific types of research, and AMSNY also advocated for continued funding for the Empire State Stem Cell Program (NYSTEM) and the Spinal Cord Injury Research Program. Likewise, AMSNY called for continued support for its Diversity in Medicine Program, which provides a pathway for middle school, high school and college students to careers in the health professions. Since 2008 the diversity programs, like many state-supported programs, have endured funding cuts; AMSNY urged legislators to restore funds in light of New York’s much-improved economic outlook. These restored funds will allow AMSNY to provide MCAT test prep and academic enrichment to students from backgrounds currently underrepresented in medicine. Despite that the visit was in the midst of budget season, legislators and staff were gracious with their time and enthusiastic in their support for biomedical research, acknowledging the critical role it plays in the long-term health of New Yorkers, and also in growing the states’ economy. Likewise, they voiced their support for AMSNY’s diversity programs and remarked on the successful outcomes of the programs, with 93 percent of graduates of the post-baccalaureate and Master’s degree programs going on to attend medical school. The Associated Medical Schools of New York (AMSNY) is a consortium of the 16 public and private medical schools throughout New York State. AMSNY’s mission is to promote high quality and cost-efficient health care by assuring that the medical schools of New York State can provide outstanding medical education, care and research.